I like eladrin. They’re like elves, but… elfier. They invoke the mythic feeling of Tolkien’s Eldar elves. 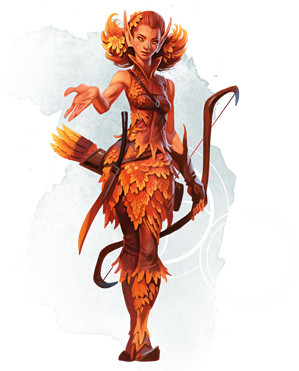 And after reading about them in Mordenkainen’s Tome of Foes, I don’t want to let my players create eladrin characters. I have two distinct tastes where high fantasy is concerned. I predominantly like to play in fantasy worlds even more cosmopolitan than traditional D&D settings. I like worlds where an arcanaloth can run a magic shop down the road from a post office run by an aarakocra. Planescape is a perfect example of this, a setting in which not just humans, but dwarves, elves, and halflings from comparatively mundane worlds like Faerûn feel like fish out of water. It takes fantasy to its logical, madcap extreme. But I also like fantasy worlds like Tolkien’s Middle Earth or the Earth of Norse mythology, humanocentric realms where elves and dwarves are fantastical creatures on par with the fey or perhaps even fiends. In Middle Earth, elves are an ancient race so magnificent that they cannot remain in the world. They constantly hear the call of the Valar and must return to the Undying Lands of Valinor. They are beings of supreme supernatural power that no human could ever truly match. D&D is not Middle Earth. Even in the grittier worlds of the D&D Multiverse, like Mordenkainen’s home realm of Greyhawk, humans, dwarves, elves, and halflings share a bespoke equality. They are all common races, as dictated by the Player’s Handbook. By casting elves as one of the common races of the Multiverse, D&D has made elves feel common. This is perfectly reasonable if you want to play a game of heightened fantasy in Planescape or heroic fantasy in the Forgotten Realms, but it does make it difficult to achieve that mythic Tolkienian feeling. Enter the eladrin. If you want to recapture that mythic feeling in D&D, you should consider never letting your players play as them. Okay, I was being a bit dramatic when I said you should never let your players play as an eladrin, but hear me out. Eladrin are elves who never left the Feywild, and thus are more akin to the elves’ fey ancestors in power and demeanor than their cousins who dwell on the Material Plane. They are to elves as elves are to humans; they take everything fantastical about the elves—their sense of whimsy, their elegant features and graceful motions, and smug sense of superiority—and turn it up to eleven. Even the high elves think it’s all a bit much. In game terms, eladrin are an elven subrace that enjoy benefits such as a limited teleportation ability called Fey Step. Their most important trait, however, is their attunement to the seasons. An eladrin’s appearance, powers, and even elements of their personality can change with their season, which they can change whenever they complete a long rest. 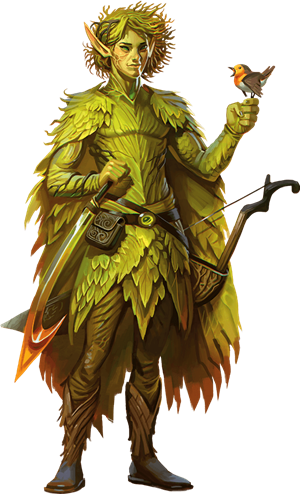 Each one of the four seasons of eladrin also appears as a CR 10 monster in the Bestiary section. They’re chaotic neutral, so eladrin are a perfectly reasonable adversary for any group of adventurers to encounter, especially if their actions are harming nature or the Feywild, endangering the object of their powerful obsessions, or even just being a nuisance. As the haughtiest and most fey of the elves, eladrin are prone to fits of passion worthy of an Archfey. If you’re playing in a typical “heroic fantasy” D&D setting like the Forgotten Realms, the eladrin open new possibilities. By filling a similar mythic niche to the one that Tolkien’s Eldar elves occupied in The Lord of the Rings, the eladrin make it easier for Dungeon Masters to create realms in their campaign setting that possess the legendary mystique of Rivendell and Lothlorien; places just real enough to feel tangible, but also somehow greater than the mundane simplicity of home. 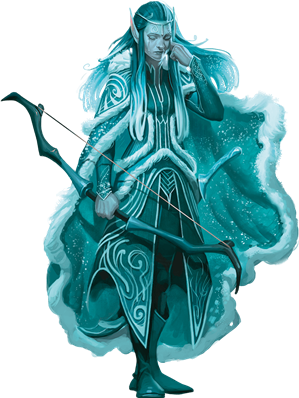 If you really want your players to view eladrin as an exalted people that stand apart from the troubles of the Material Plane, the easiest way to do this is to ask your players not to create eladrin characters. Thanks to all the new lore for elves presented in Mordenkainen’s Tome of Foes, even playing a “regular” elf can be a novel experience. If the tone of your game isn’t your concern, then you should also consider how an eladrin character will affect the cohesion of the adventuring party. Eladrin are forces of fickle chaos that consider themselves superior to nearly all other living beings. This is all excellent roleplaying fodder, but think about who you’re playing with for a moment. If your players are the kind to make trouble and then try to excuse it by saying “But I was just doing what my character would do,” then including eladrin as a playable subrace will probably hurt your campaign in the long run. Giving your players the option to play as fey or fey-adjacent characters is almost always a bad idea unless you have the emotional fortitude to take your problematic friends aside and try to work out a solution. That said, there's no right way to play D&D. I wouldn't let my players create eladrin characters in a game with a mythic tone unless someone pitched me a really excellent reason, but that doesn't mean it could never work. Flatly banning a new player race might be a bridge too far for you. If one or more of your players are excited about this gorgeous and fantastical new type of elf, you should just let them play it. D&D is all about having a shared narrative experience, and your players’ choices should inform the narrative. 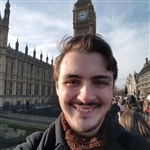 Even choices as simple as “My character is an eladrin paladin who follows the Oath of the Ancients” can set the story on a wild and unexpected path, and it is your job as the Dungeon Master to embrace the chaos and learn to engage with the curveballs your players throw at you, so long as they’re doing so in good faith. Eladrin characters fit cozily into games that embrace the wet-‘n-wild heightened fantasy of Planescape, but they are not so far from home in games of mythic fantasy. Legolas joined the Fellowship of the Ring, after all. In fact, Legolas is an excellent example of an elf (or in our case, eladrin) heightening the mythic tone of a story through his familiarity rather than detracting from it. The entire point of the Fellowship of the Ring was that all races of Middle Earth, even the exalted elves, had to band together in order to defeat the Dark Lord Sauron. You can heighten the drama of your story if you frame your player’s eladrin character as an ominous portent—a sign that things have grown so dire that even the Feywild has sent its people into the Material Plane. Or, the eladrin character could be an outcast from their homeland, forced to wander the Material Plane estranged from their magical homeland. Here’s a table of Ideals you can use for eladrin characters to explain why they have left the Feywild and have joined an adventuring party, all while maintaining the mythic feeling of their race. You can use these Ideals instead of (or in addition to) the Ideals suggested by your background. Do the eladrin have a home in your campaign? If they didn’t before you read Mordenkainen’s Tome of Foes, will you try to create a niche for them? Adding new races and creatures to a carefully crafted campaign setting can be an exhausting task, and players asking to create a character of a race you never added to your setting can be the source of many hours of rewriting. How have you handled eladrin in your home campaign? James Haeck is the lead writer for D&D Beyond, the co-author of the Critical Role Tal'Dorei Campaign Setting, and a freelance writer for Wizards of the Coast, the D&D Adventurers League, and Kobold Press. He lives in a five-room apartment/dungeon in Seattle, Washington with his partner Hannah and his two kitten-shaped fey tricksters, Mei and Marzipan. You can usually find him wasting time on Twitter at @jamesjhaeck. We have *way* too many elves that can be already covered by existing stat brackets. What about races not available, that are playable in other settings? I want to play a gnoll in Eberron where they retconned demon spawn, not play *more elves*. After reading Mordenkainen’s, my first thought on playing the Eladrin was that its flavor as an added value in a campaign would be completely dependent on the approach, with some high highs and low lows. I feel like it would be a mistake for a character just to randomly pick a season every morning just for the sake of keeping a party on their toes, and over-blowing the emotions listed for each season would become tiresome after a few sessions. However, in the hands of a clever player, this form feels like solid gold. I'd love a player who really stressed the autumn and spring moods, that almost play right into the hands of being a part of a diverse party. And if the party is begging for frightening or fire benefits from the character? Well, then they get to deal with the sulky or aggressive persona to match. I agree with your notion that inexperienced players shouldn't be roleplaying as Eladrin. However, I think your comparisons to Tolkien elves are somewhat of a misnomer. Thematically they are much more similar to the faerie creatures in Shakespeare's A Midsummer Night's Dream. These creatures are far removed from the heroic countenance that the elves display in Tolkien novels. 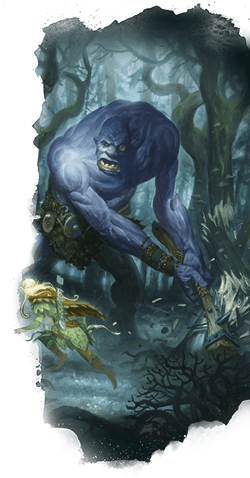 The Unseelie fey are basically an entire culture of fey creatures that enjoy taking dark and sometimes hostile actions against other fey and humanoids (when they can). I also don't think letting players play Eladrin is any more problematic than letting them play a Yuan-ti character from a narrative perspective. It all depends on the ability of the player. I like the niches that the new Eladrin open up -- I was so compelled by the Spring Eladrin's Fey Step that I decided to create a whole character with the homebrew Doctor background who's so into keeping others safe, healthy, and happy that he's willing to teleport them out of harms way, knowing he'd be taking the brunt of the damage meant for his "patient". It really jives with the whole, "When someone is injured, I will drop all other responsibilities to tend to them," personality trait of the Doctor background. Plus, with the Protection fighting style, you have a really interesting new niche for a Fighter pseudo-tank -- instead of being a damage sponge and drawing agro, you're the sort of reserve force for whichever party member is in the most trouble. That said, I totally understand not wanting to deal with those things -- especially because a player who often minmaxes could choose them simply for their ability to reinforce their goals. However, I actually think this version of the Eladrin is actually less prone to the whole clickbait-y, "BEST BUILD IN D&D -- OVER 90,000 DAMAGE! GONE WILD," trend of minmaxing, and helps with the more fun gimmicky form of minmaxing that happens when a player thinks to themselves, "Hey, y'know what? I want a character who is inhumanly charming at the expense of literally anything else," or, "I want the most socially inept, edgy emo teen character I can think of." When you add in these specific Fey Step features, it forces them to make a critical choice about it on some level, rather than just saying, "Oh, if I take Eladrin I can teleport at first level, and that's a solid advantage." Of course, the OG Eladrin that we've had forever (the ones without special seasonal abilities and personality characteristics) is always an option if players just don't want to think about it -- one of my new players just opted for it, in fact -- and the MToF version does say that the seasonality of Eladrin may of may not change essentially at will, which seems like something a DM might at least want to limit in some way. Doing so will help people coming to the site for the first time to not think that you're trying to oppose what Wizards of the Coast has officially published, which is absurd because this is officially licensed, so... yeah. This, honestly. I don't mind Eladrin being available, but I would have liked something different first. I would have liked to have an official 5E versions of Eberron races like Warforged, Kalashtar, and Shifters. Or, like TheKoboldHero said, playable not-demon Gnolls. I actually kinda like the Eladrin and Shadar-Kai, but we could have used some more variation before we got to "Higher High Elves and Darker Dark Elves." Sea Elves are cool though. This kind of comes off as the same as people that don't like tieflings in their games. Or monks. It doesn't fit the aesthetic the GM wishes to create, or the DM insists that tieflings must be evil, or whatever. And you know what? That's fine... for those specific tables. I would never suggest that it shouldn't be a playable race, however. First and foremost, I'd like to remind folk that elves are fundamentally fey in nature, and that everything fey runs parallel to... well... everything. But more so. Though this is poorly reflected in most D&D settings, the human race is vastly diverse. It only makes sense then that a (fairly) dominant species from another plane of existence be equally diverse. Moving on: Personally, I'm a fan of working with a player to permit any foreseeable race-class-alignment combo, having personally played characters belonging to races that were fully apart from any D&D setting, and classes in blantant defiance of alignment restrictions (I once played a chaotic paladin, justification being weather is fickle and unpredictable, so a storm god's champion should be able to behave the same way). Thus, I have always empowered my players to do likewise. I am also a fan of the philosophy that too much of anything special makes it not special anymore, which seems to be a central idea of this article. But: there are ways to control that. To keep the special things special. All your players want to be elves? But still want elves to be rare and elusive super mythical peoples? No problem. Remove all elf NPCs; or substitute them with members of another race. Have the players be the immediate object of attention from any NPC they go anywhere, ever, because no one has ever seen a real-life elf before. This attention can be positive, neutral, or negative. Positive: people treat them like celebrities, because in essence, that is what they are. Neutral: they literally can't get away from the stares or people asking if they can touch their ears. Negative: supremacists for another race, or far too many non-elf people having firmly rooted, unshakeable stereotypes. Logic seems basically to me to just be "Official content should be modified as needed to fit your campaign." Which certainly makes sense, as long as both DM and players are in agreement. I've restricted my players from being Aasimar, simply because the Aasimar in my campaign have far more baggage attached. Any Aasimar character would completely overshadow and dominate all aspects of social roleplay in this world. The players were notified beforehand and agreed to it, but I had also made it clear that the setting was still in development and I could make changes if there was real push back. Edit: Because the article asked if we'd made a home for the Eladrin in our setting, yes I did. In fact, I'm making use of both the Eladrin and Blood War by combining them in a very Dresden Files fashion. In my setting, the Nine Hells will be the civilized center of the Abyss. Demons and Devils will be of the same plane, with devils over demons. The "Blood War," to be named, will be those of the Abyss and Nine Hells attempting to access the Material Plane. However, a plane lies in between, which includes my versions of both the Feywild and the Shadowfell. The plane that contains the Feywild effectively encircles the Material plane, with the Abyss and its celestial counterpart encircling that plane. The eladrin. along with other fae, will fall into the broad camps of the opposing Summer and Winter Courts, or the independent and varied Wildfae. The war between the daemonic and the fae is as eternal and bloody as MToF's Blood War, and in both cases it's not a Good vs Evil fight. The Fae are a defensive wall between the Abyss and the Material world, however it's a defense of circumstance only. Both seek to influence the material world for their own ends, as history is replete with examples of mortals who fall under the spell of the fae or condemn themselves by consorting with devils. Both struggle with internecine conflicts that sabotage their efforts and maintain the cycle. There are plenty of hooks for a player to choose to play one (and one will be for a brief series of one-shots). Perhaps the eladrin is of the Wildfae, and seeks to distance itself from the war. Perhaps the eladrin is a member of their Court's agents in the material world, the introduction of a new faerie faction to bring alongside the Harpers and such. Perhaps the eladrin is young, and their seasonal mutability is evidence that they have not yet been claimed by one of the Courts or rather not yet made that decision for themselves. Perhaps the eladrin is a veteran of that war, and now patrols the material world for incursions that seek to circumvent their defensive line, or locate and eliminate their mortal vassals. The fae certainly don't want to fight the demonic forces and their allies on both sides. One of the best parts of D&D is that you can play a Gnoll in Eberron if you would like. I actually really like the Eladrin subrace after reading and really getting into them and their aesthetic. I don't particularly like how chaotic their gameplay is, but from what I read, I don't think PC Eladrin are allowed to change their Season everyday. Basically 4 different characters in one with 4 different kinds of fey steps seems a bit excessive and I only saw that change of season option for the NPC Eladrin. I could definitely have overlooked that, but as a beginner DM, that's hard for me to keep up with regardless. What I decided to do as a means to alleviate the stress for myself before it became popular at my table was to allow my players to take on an Eladrin variant through the Half-Elf race. By choosing the variant, they get fey step without the Seasonal variant, and their emotions change a specific part of their physical form. For example, a Half-Elf in my game has luminescent body hair that changes color and texture based on the corresponding emotion and season. I've made Eladrins the "Aasimar" of the of the Elven community and near impossible to find. Though, my players have expressed over the past few days that a mini quest to find a true Eladrin would be something they'd be interested in running. I really like the Eladrin introduced in Mordenkainen's Tome of Foes, and will almost certainly be allowing them. I've read through MToF a couple of times now, and I don't believe it ever does say that Eladrin are arrogant/think themselves superior to everyone else, and certainly not to the extent that will disrupt a campaign. What it does say are that some eladrin are 'haughty' around other elves, while others show a 'tender kindness'. I don't see the former as a problem, but the latter definitely wouldn't be. The Spring and Autumn seasonal variants seem particularly friendly. It also says that some eladrin can pass for high elves - if they're too exotic for your campaign as they are, you could have the player's eladrin appear less fantastical and closer to high elves. As a Tolkien fan, I feel I should say that Legolas is actually a high elf by D&D standards. Technically he's a grey elf, like those in Rivendell, and the high elves of Greyhawk just so happen to share that name. By contrast, he's actually the prince of the Woodland Realm (Mirkwood), and those elves there are wood elves in LotR, and match well with D&D's wood elves. The PHB depicts all elves as otherworldly, and I feel that whether the previously-available elves are common or not is up to the DM of each game. By extension of that, so are eladrin - personally, in my games, I will likely just have many non-elves mistake eladrin for exotic/unusual high elves. I love elves, and I would absolutely love to have more options to play them! I personally would play an eladrin who wants to understand what does it mean to be a good person. what is even Good, why should I be empathic? I think that this would bring up amazing roleplay. Hang on, are you saying that WotC are trying to force me to use Eladrin in MY campaign? I thought MToF was an optional supplement! Do I need to buy MToF in order to be playing "Official D&D"? Adding "in YOUR campaign" would water down the title and insult the intelligence of readers. The whole point of articles like this is to get the reader to think. I don't think James cares one way or another about whether people agree with him, as long as they understand what he is saying and form an opinion of THEIR OWN. And were perhaps entertained and encouraged to come back and read more of his articles. If readers are going to get upset by a title then they really should stay off the internet, where 'click-bait' IS a real thing and hard to opt out of. Yeah, who wants to play a fantasy character in a fantasy roleplaying game. Based on this point of view we should also eliminate Goliath's, Warforged, Tieflings, Tabaxi, Aarakockra, Genasi, Aasimar, Lizardfolk, Kenku, Tritone, and every single playable monster race. After all, we want to keep our imaginary games as accurate to REAL fantasy as possible. Eladrin are villains in my campaign, so certainly discouraged as PCs. Playing in AL, we are currently running a well run campaign of HotDQ and to be followed by RoT. I have just rebuilt my level 4 high elf into an Eladrin Fighter with the Spy background. Sent to the material plane to gather information vital to protecting planar travel and the Feywild. Thankfully HotDQ is just a huge information gathering campaign but when we get to RoT our DM is sure to have some fun with the Eladrin storyline. In my FR campaign I do not allow Eladrin, Aasimar as playable races. Period. Many of the races you list are often played as scaled, feathered, short, or metal? humans. Perhaps, with the cosmopolitan nature of some D&D cities, Aasimar might pick up many human traits, but Eladrin as recently portrayed in official sources just don't mingle with humanity. They are literally worlds apart most of the time. If you use the Eladrin, (PC or NPC) but the world doesn't change in flavour, then you may have missed an opportunity.